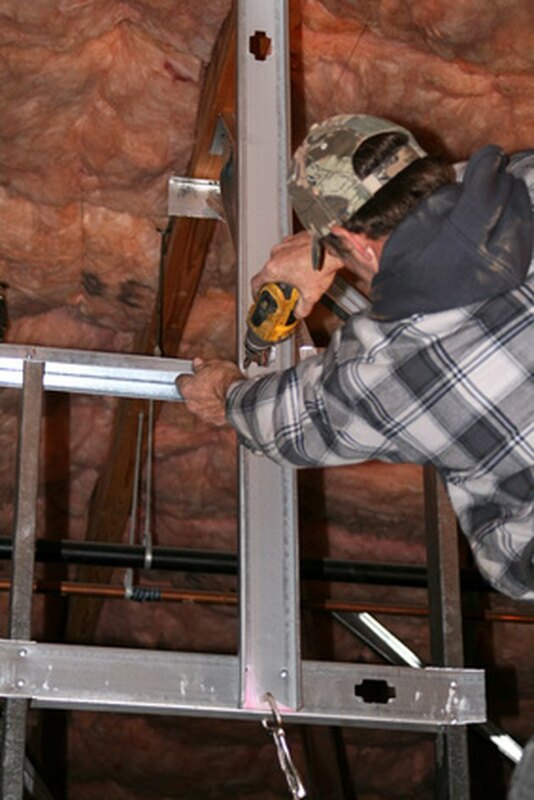 Steel studs are used for many applications, particularly as the framework for basements in areas with high flooding. These metal studs can withstand the water much better than the wood ones can and keep the basement from growing moisture and mildew, which is common with wood studs. Fastening wood to metal studs is no different than fastening wood to any other type of metal. With a few simple instructions, it can be accomplished in no time. Metal studs are very common in households. Inspect the wall to make sure it is strong enough and can withstand the weight that is going to be added to it. Run a stud finder along the wall to locate the studs. Mark the location of the stud that is going to be drilled into with a pencil on the wall. Measure the piece of wood and line it up next to the metal stud to verify that it will fit properly. Insert the proper Phillips head drill bit into the drill. Tighten the bit in place and verify that the drill is working properly by turning it in both directions. Set a 2 1/2-inch self-tapping screw into the drill bit and line it up on the wall where it will be installed. Press down firmly on the drill and turn it on to begin pushing the screw in place. Drill through the wall and into the stud until the head of the screw is flush with the wall. Pull the drill back and line up the second screw. Install it in the same manner and continue until all the screws have been installed into the metal studs. What Size Screw Do I Use With 1/2-Inch Drywall?